Elsewhere in the Dutch city of Rotterdam, brand strategists of Unilever, the FMCG giant are on a panic video conference call with their counterparts in India. The key point of discussion is how to stop their main competitor in Oral care segment – ‘Colgate’ from walking away with a sudden spike in the market share in India. Random surveys in different cities and towns in India revealed that “Coalgate” emerged on top of the mind and lips of a majority of Indians these days! It’s not just the Unilever brand managers who were having sleepless nights. Ever since the report of the Comptroller & Auditor General (CAG) on Coal block allocation hit the public domain, it has spread insomnia among quite a few in the ruling front as well. The opposition has smelt blood and resembles these days “The Gangs of Wasseypur” and are doing everything but short of spilling blood on the streets or on TV. The CAG report set a new record for the number of “0”’s in a digit for a scam and proclaimed that there is a loss of Rs. 1.86 lakh crore ( US$ whatever!!! ) caused by delaying the auction route for allotment of coal blocks instead of allocation by a screening committee which was seemingly opaque. It would seem that from a 55 cr scam (Bofors) in the 80s to 1.86 lakh cr scam now we have indeed come a long way even after adjusting for the high inflation!!! Who said we are an emerging nation ? Guys, we have arrived!!! I’ve not read the CAG report and hence my observations in this post are based on what I’ve been reading and watching in the media in the last 2 weeks. It’s good to see institutions turn watch dogs and uphold the principles basis which they have been founded. However if they become the rabble-rouser variety which is what the CAG has turned into then we have a problem. The track record of CAG in floating purported loss figures and diluting the same as time passes has not been so impressive. Keeping that aside, the problem I’ve with this report is that it presents a purely accounting perspective (that too a faulty one) in arriving at the loss figure which is in essence an opportunity loss or a presumptive loss. A congenial environment needs to be created for private sector to invest in infrastructure and set up factories, facilities, … which in turn will create millions of jobs. It’s been a while ( may be the late 80s’s) since Govt. encouraged private players to engage in mining of coal to produce fuel for power generation plants. India is already short of power not to forget the grid failure which consigned 600 mn Indians to darkness a month ago. 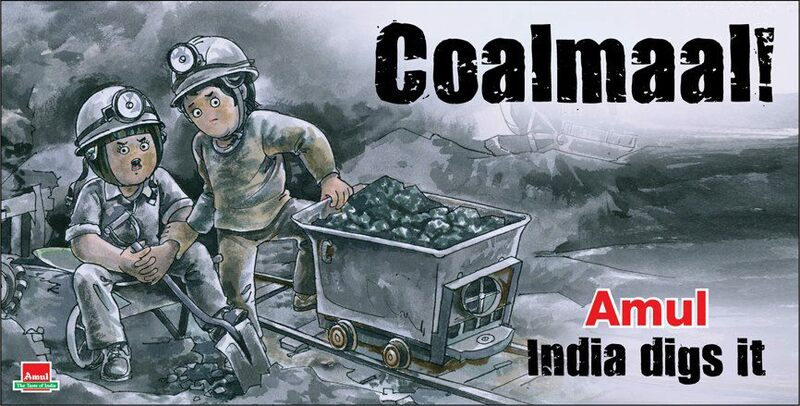 Coal India which is a Govt. owned entity is unable to meet the demand of coal. Under the circumstances, if the Govt. of the day (whether the central Govt. or under advice of the State Govt.) decided against auction and went by allotment (arbitrary is what critics claim) to private as well as public sector, the Govt. cannot be blamed for not being opportunistic of earning in millions! Any auction route which is competitive in nature while raking in the moolah for the Govt., it also escalates the cost for the bidder and after bidding through the nose you cannot expect the product to be priced cheap. The cost of 3G services in India now bears testimony to it. Hence I’m not surprised that political parties including the UPA, BJP and the left (in the states) were not pushing for the auction route in mine allocation for all this while. Hell will break lose if the cost of power is not kept affordable. So calculating a loss and putting forth an argument based on what the Govt. would have raked in if the auction route was pursued is indeed specious. If you stretch the ‘presumptive loss’ logic further – whatever the Govt. does in the form of a subsidy is an opportunity loss. Like the money it spends on schools where students are being taught for free, is a drain on the exchequer if you compare to the fees charged by a similar private school, isn’t it ??? If the share price of companies sky rocketed after they have been allocated coal mines, it is simply a function of how share markets function across the globe! Govt. cannot be blamed for the valuation or the market cap curves of the companies based on the vagaries of the stock market. The Govt. is being faulted for allocating 145 blocks against mush lesser during the previous NDA government. Now this is stretching the limits. If you govern and do something it’s a problem. If you don’t do anything also its governance deficit. There is clearly a surplus of cynicism here. I’m not a fan of this govt. and I’m also not in agreement with the “0” loss theory foisted by the Govt. (not mined so no loss!!!) It is clear that there needs to be a consensus among all parties on how natural resources like Spectrum, coal blocks, land,.. are used for achieving the larger economic growth irrespective of who is governing the country. This will ensure that there is consistency in policy and no witch hunting or retrospective levys on private investors which in turn will see a spur of investments in these key areas. The 2G scam and now the “Coalgate” scams only highlight the need for more transparency in Governance than what exists today. We don’t need more “Gates” or CAG reports for “*** lakh crores loss” but what we need is “open, transparent” methods and processes in Governance. P.S : It seems there is a section of BJP which wants to launch a “India Mining” campaign for the next elections!!! Actually Anand it is so true. I mean we have always been used to scams and the ‘gates’. If they don’t happen it will become very unusual. The bofors, telgi, cwg, and now the coalgate. Well what’s next.. Guess the koreans have really come out with an appropriate tag line just for India and it seems to be suiting us – no wonder their market share is soaring. Hi Nirmal, thanks for the feedback. BTW, what is the tag line of the Koreans ??? Just amazing to see the post like that.